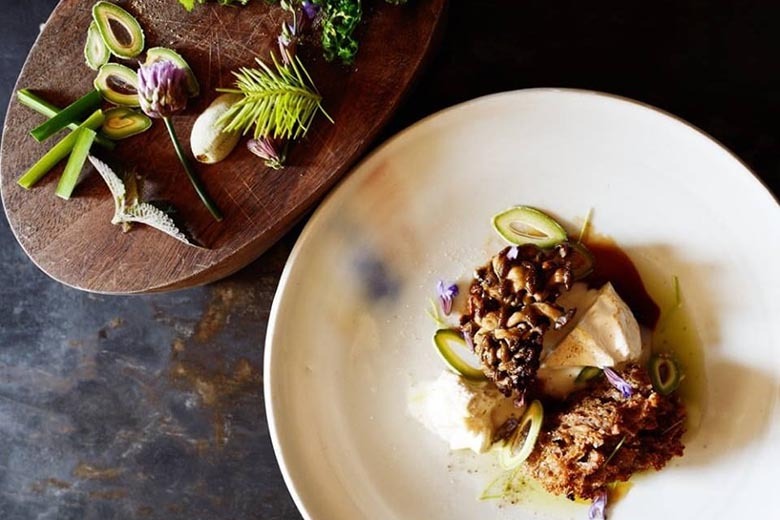 These are some of our restaurant recommendations and ratings based on feedback from our guests as well as our own experience dining at these establishments. Price ranges are indicative of the average cost of a main course. Note: Some places require advance bookings, which we can assist you with. 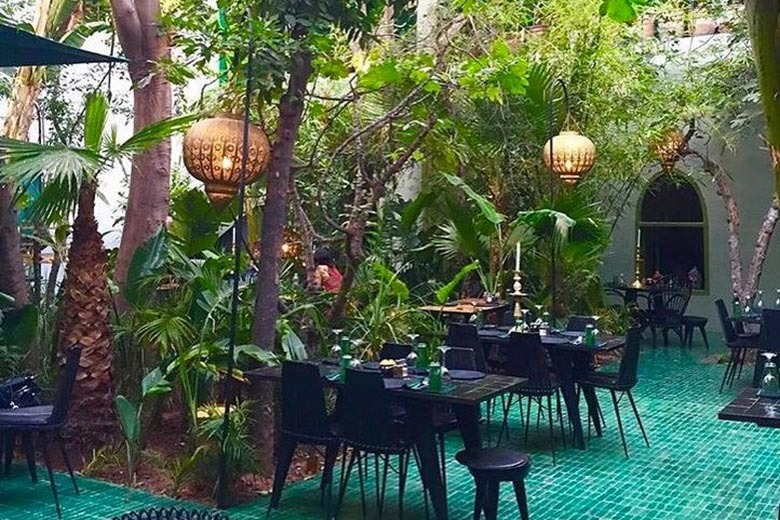 This modern Moroccan eatery and rooftop cocktail bar, with its sleek sand-coloured sofas and black-and-white tiled tables is only a minutes walk from the Riad. Advance bookings recommended. 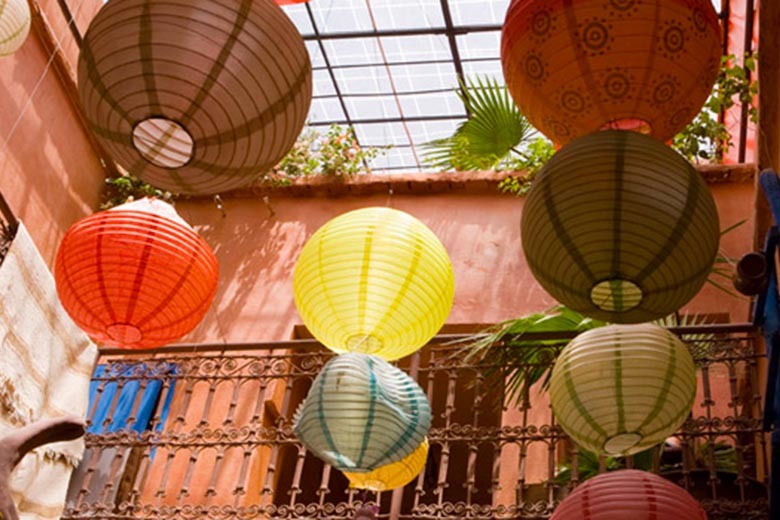 The Café is a landmark in the Spice Market and is also a pioneer of the continental food scene in the medina. It offers simple refreshments and food, as well as a wonderful terrace overlooking the marketplace. 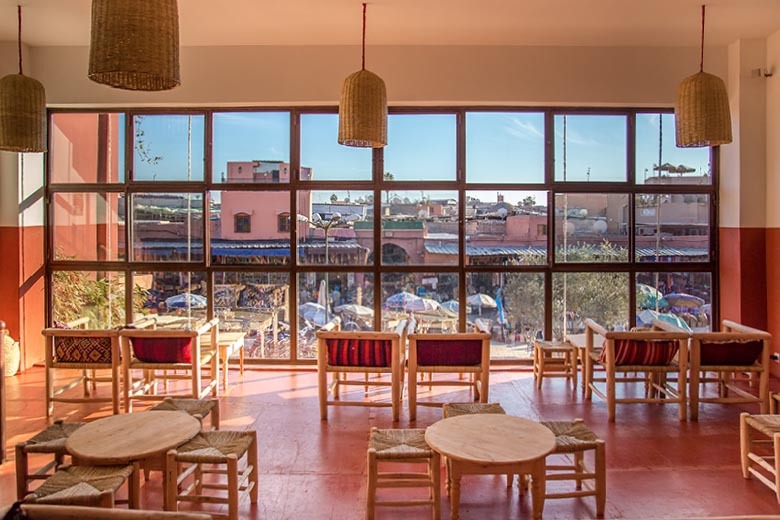 This terrace café is located in the bustling Place Bab Ftouh en route from the Riad to Jma El Fna square and serves delicious local salads and main courses. The multi-floored Zeitoun Café overlooks Jma El Fna square, and serves meat as well as vegetarian meal options. Although there is a nice outdoor terrace and ambiance, service can sometimes be slow. For a late afternoon beverage while the sun sets, or for an evening meal on the terrace overlooking Jma El Fna square, this restaurant is popular among locals and tourists. 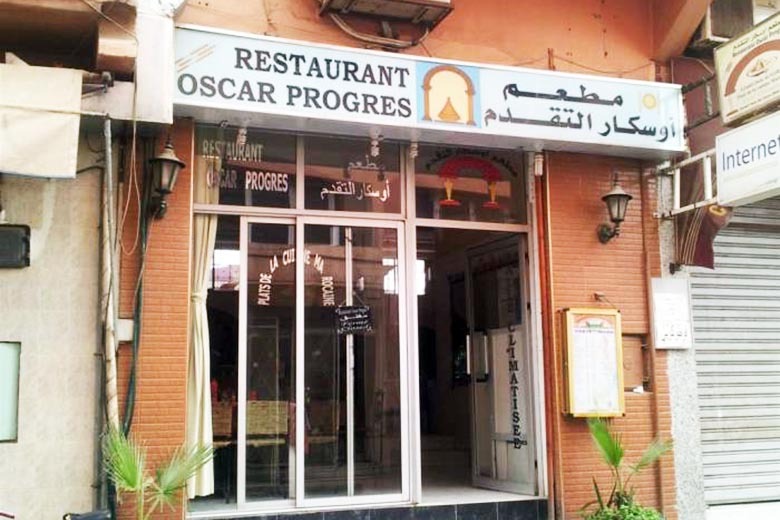 Oscar is more like a cantina, but is a hidden gem which can be found along a narrow street in between the Post Office and Bank Al-Maghrib just off Jma El Fna square. 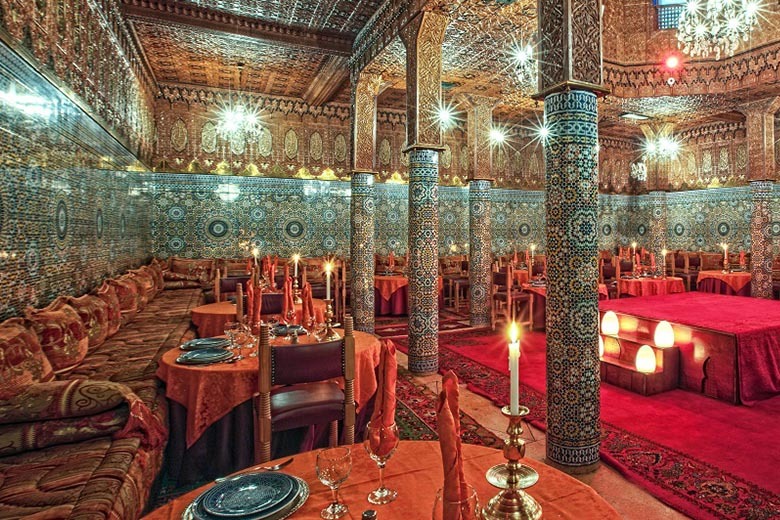 It serves delicious authentic Moroccan food for a very reasonable price. This little café serves good-value non-Moroccan meals. Dishes such as enchiladas, Tex-Mex burgers and felafel sandwiches feature on the menu, all served with a tangy rice salad and chips. With limited seating, waiting times can sometimes be long. 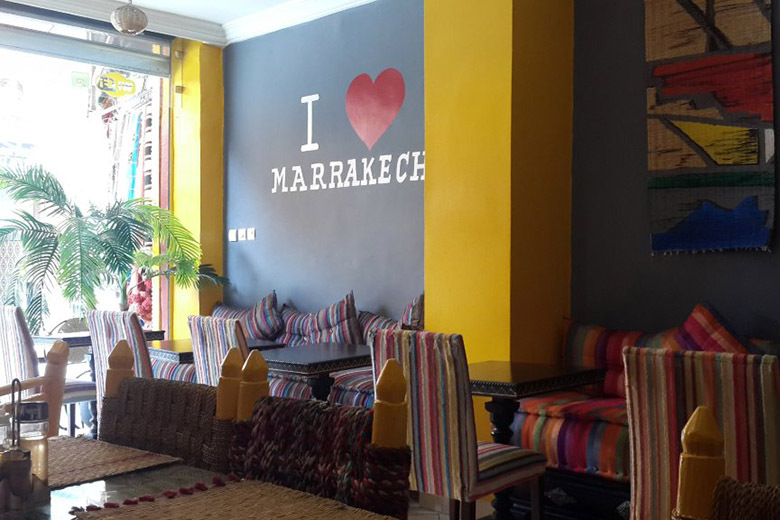 A cheerful and colourful establishment with a typical Moroccan cuisine. 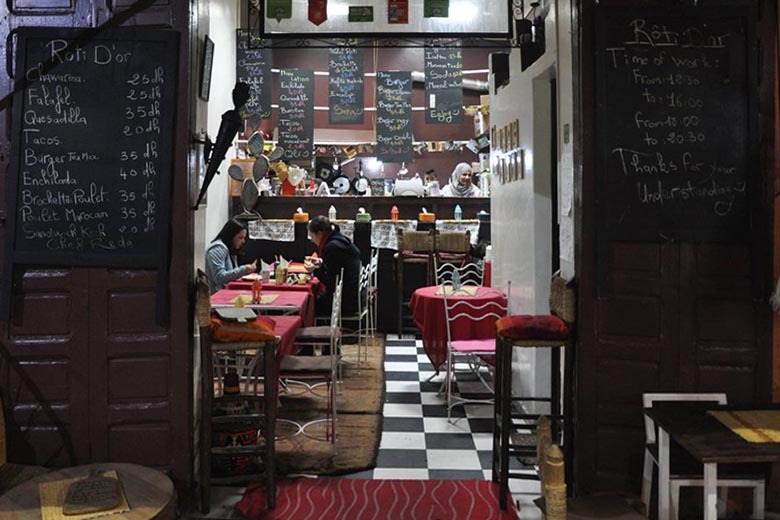 The restaurant is located in the bustling "Golden Triangle" of small eateries just behind Cafe France. 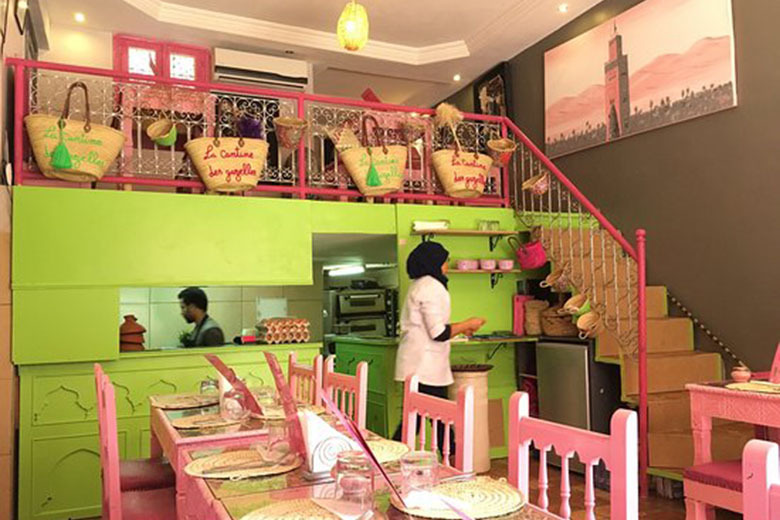 Café Babouche is a very good option for both Moroccan cuisine and continental food including pizza, pasta and burgers at very affordable prices. They often have live music from local artists too. First opened in 2007, Earth Café serves vegetarian meals as well as some vegan options too. 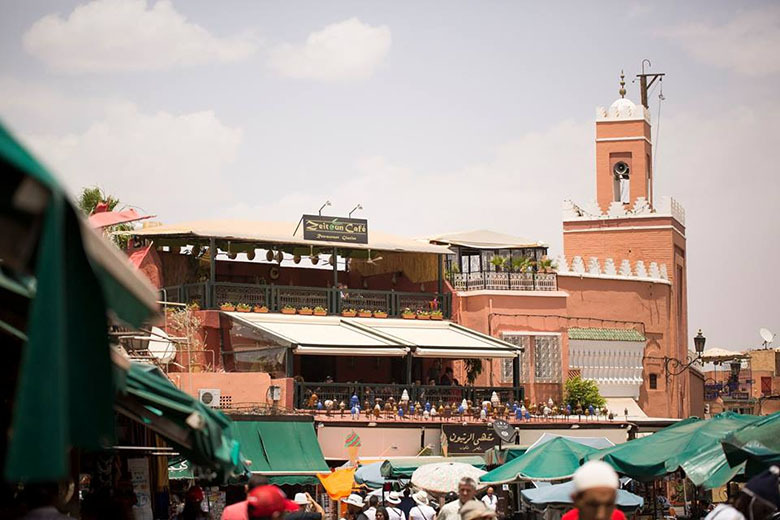 It's located just off the main square, Jma El Fna. 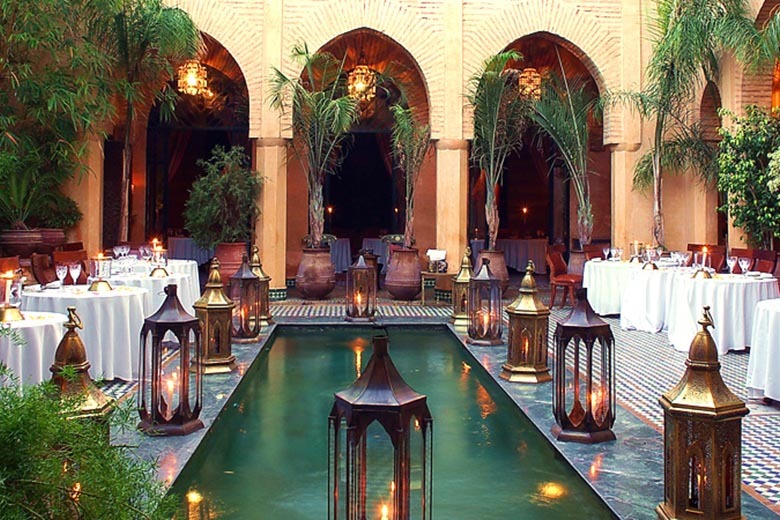 The restaurant is in an authentic 17th century palace and has been renovated according to the traditions of Islamic art. 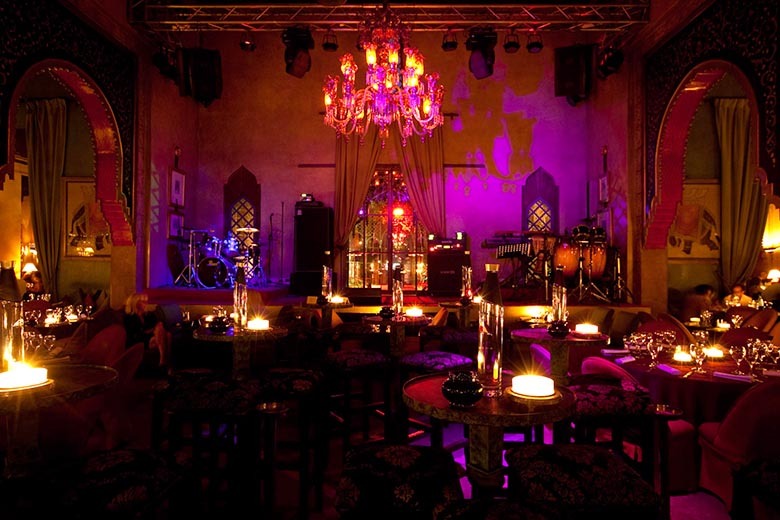 On the menu is fine traditional cuisine while being serenaded by a Marrakchi orchestra and dance show. Advance bookings recommended. Take a seat beneath an overarching canopy of banana leaves, bamboo and palms, and watch tiny tortoises inch across the iridescent green floor-tiles. You can order from a variety of continental or local dishes. Advance bookings recommended. 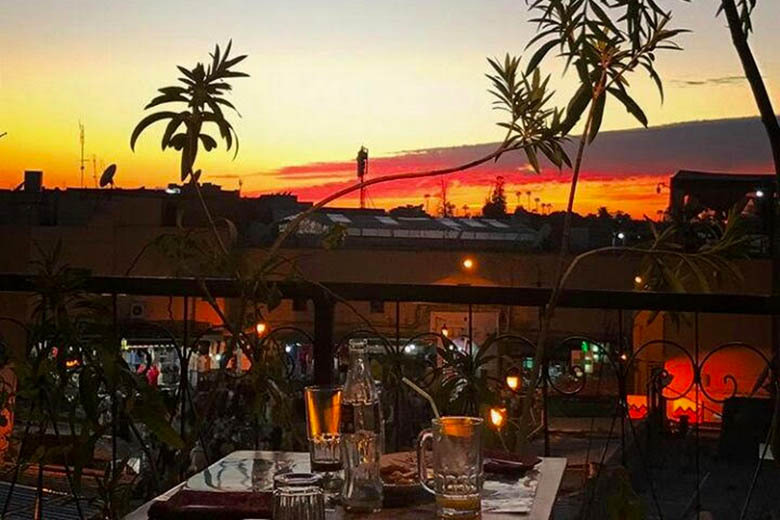 This airy restaurant on a terrace overlooking the Cherifa Souk serves up light, simple dishes in a relaxing ambient environment to pass away a few hours. 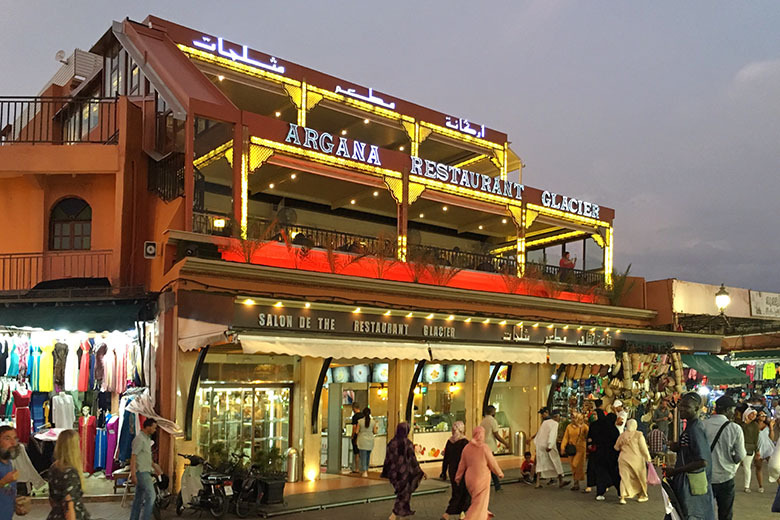 Found in the affluent Hivernage district, you can enjoy a choice of continental, Asian and Moroccan food as well as entertainment of live shows, bellydancers and live music bands. Advance bookings recommended. 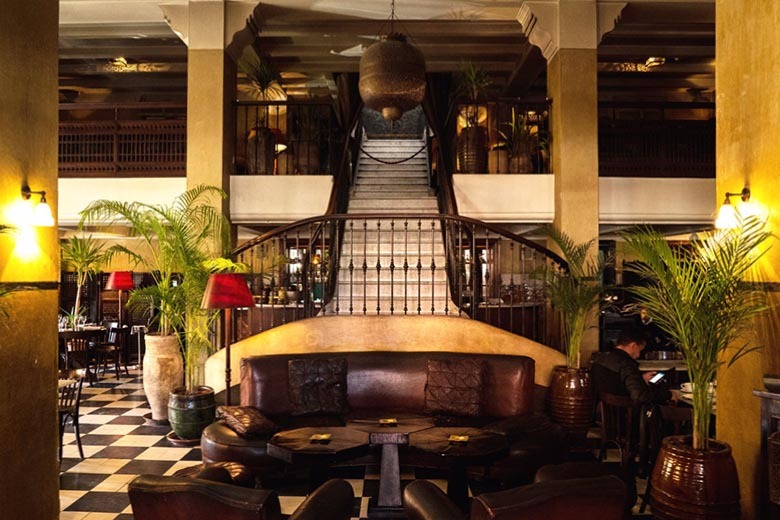 This colonial Art Deco bistro attracts guests to its shady terrace and palm-filled, 1930s interiors. Food is a fine blend of French-Moroccan dishes, and happy hour between 6-8pm. Advance bookings recommended. 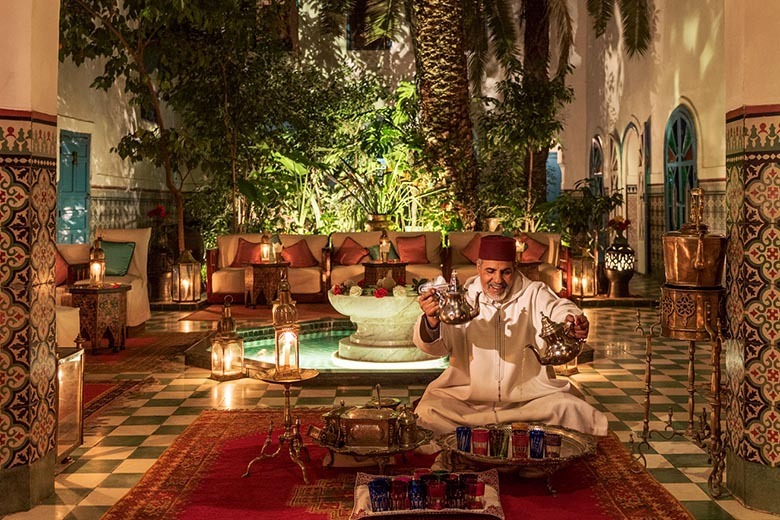 The restaurant is in a restored mansion in a spectacular setting with lively Gnaoua musicians. Dishes are a fusion of French, Moroccan and Andalucian influence. Advance bookings recommended. 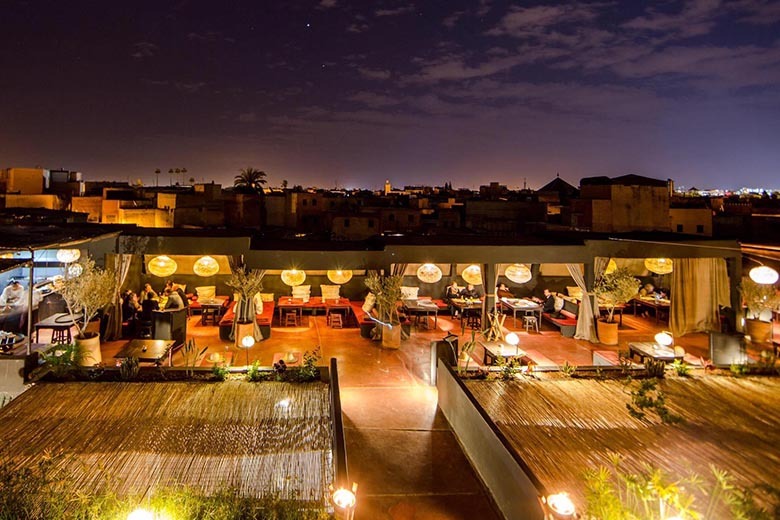 The restaurant is a landmark of Marrakech with enchanting decor and a breath-taking panoramic view from the terrace overlooking the medina and the Koutoubia mosque. It serves traditional gastronomic cuisine. Advance bookings recommended.